You'll be £10.00 closer to your next £10.00 credit when you purchase Alastair Denniston. What's this? Some of the individuals who played key roles in the success of Bletchley Park in reading the secret communications of Britain’s enemies during the Second World War have become well-known figures. However, the man who created and led the organisation based there, from its inception in 1919 until 1942, has, surprisingly, been overlooked – until now. In 1914 Alastair Denniston, who had been teaching French and German at Osborne Royal Navy College, was one of the first recruits into the Admiralty’s fledgling codebreaking section which became known as Room 40. There a team drawn from a wide range of professions successfully decrypted intercepted German communications throughout the First World War. After the Armistice, Room 40 was merged with the British Army’s equivalent section – MI.1 – to form the Government Code and Cypher School (GC&CS). Initially based in London, from August 1939 GC&CS was largely located at Bletchley Park, with Alastair Denniston as its Operational Director. Denniston was moved in 1942 from military to civilian intelligence at Berkeley Street, London. Small at first, as Enigma traffic diminished towards the end of the Second World War, diplomatic and commercial codebreaking became of increasing importance and a vital part of Britain’s signal intelligence effort. GC&CS was renamed the Government Communications Headquarters (GCHQ) in June 1946, and moved to the outskirts of Cheltenham. It continues to be the UK’s signal intelligence gathering organisation. With the support and assistance of the both the Denniston family and GCHQ, Joel Greenberg, author of Gordon Welchman, Bletchley Park’s Architect of Ultra Intelligence, has produced this absorbing story of Commander Alexander ‘Alastair’ Guthrie Denniston OBE, CBE, CMG, RNVR, a man whose death in 1961 was ignored by major newspapers and the very British intelligence organisation that was his legacy. 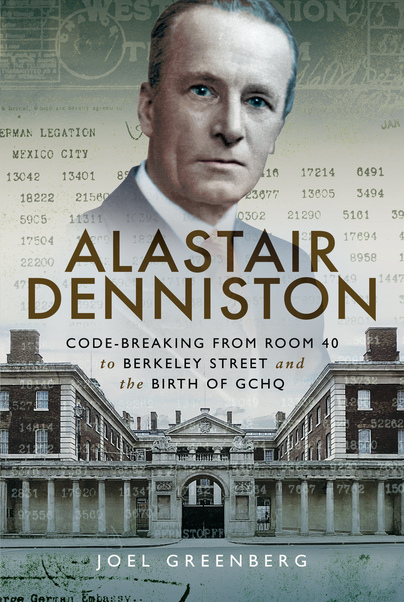 Alastair Denniston: Code-breaking From Room 40 to Berkeley Street and the Birth of GCHQ is the expertly researched biography of the man who created and led the British intelligence organization best known for cracking the Nazi's codes in World War II, although its operations stretch back to the First World War, and its legacy continues to this day. Author and historian Joel Greenberg draws the reader into the complex world of intelligence, cryptography, and politics. Written with a scholar's attention to detail, yet accessible to readers of all backgrounds, Alastair Denniston is highly recommended especially for public and college library Biography collections as well as personal reading lists. The author is a specialist in signals intelligence and has provided an enthralling account of Alastair Denniston and his contribution to modern electronic intelligence. This book follows from his excellent biography of another great of signals intelligence, Gordon Welshman – Most Highly recommended. ★★★★★ I found this book very exciting as it explained signals intelligence very clearly and then unfolds the story relying entirely on source material. This begins in Room 40 with the subsequent setting up of GC&CS in 1919. The preparation for Bletchley Park and the complex dynamics that developed. Pivotal new material reveals the role of Berkeley Street and the American relationship. If you want to KNOW about the origins of GCHQ this is the book. ★★★★★ Extremely well-researched book uncovering a little-known story about the development of Bletchley Park and GCHQ as centres of excellence in code-breaking and intelligence gathering. It is well written and fascinating. Alistair Denniston was a man who recruited Alan Turing and other people outside the usual field of crypt-analysts and in doing so changed the way intelligence services worked. He was instrumental in instigating the 'special relationship' between the British and US intelligence services, which continues to this day. Very little has been written about Denniston previously; he appears in indexes and is mentioned in passing in many other books about Bletchley, but this is the first one to focus on his role, both in Room 40 at the Admiralty during the First War and his subsequent service during WW2. It's a nicely published hardback book, with high production values. Should go a long way towards negating the image of Denniston served up in the film 'The Imitation Game'. I recommend highly. ★★★★★ An excellent book, demonstrating clearly the importance of Denniston's crypto work in both WW1 and WW2. It was Churchill himself who, in 1919, nominated Denniston as head of a new organisation - the Government Code & Cypher School - and in 2012, it was the head of GCHQ (successor to GCCS) who publicly paid tribute to Denniston's pioneering work in the late 1930s, and especially his crucial realisation that mathematicians would be essential in the age of machine cryptography. Many writers on Bletchley Park have rather lost sight of Denniston when he moved to London in 1942, as GCCS Deputy Director (Civil). Joel Greenberg shows how industrous and successful Denniston was in this new role, with thousands of decrypted nessages being passed to the Admiralty, the War Office, the Air Ministry, MI5, etc. This book reveals the true Denniston, in complete contrast to the pernicious fabrications of 'The Imitation Game'. is an author and historian. He received his PhD in Numerical Mathematics from the University of Manchester (UMIST) in 1973. He worked for the Open University for over 33 years, and held a number of senior management positions at Director level. He has written the authorised biographies of two key figures in the story of signals intelligence, Gordon Welchman and Alastair Denniston. The Welchman book, Gordon Welchman, Bletchley Park’s Architect of Ultra Intelligence, is the basis of a joint BBC/Smithsonian Network 2015 documentary about Welchman – The Forgotten Genius of Bletchley Park. The Denniston book, Alastair Denniston, Code-breaking from Room 40 to Berkeley Street and the Birth of GCHQ, is both a biography and an account of signals intelligence from its early development to the birth of GCHQ. Denniston was the first Head of GCHQ and the book was launched at its headquarters on 7 September 2017 in honour of him.